You can use JungleDocs to easily create Word reports. 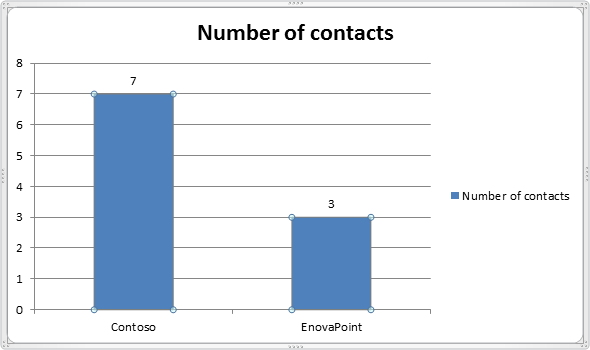 Part of this functionality is that you can use the data from your SharePoint lists to immediately create graphs and charts in Word. In this tutorial, you will learn how to do this. Note: creating charts is not supported in Small Parts. If you need to fill chart data using JungleDocs, the chart must be placed in the document template. 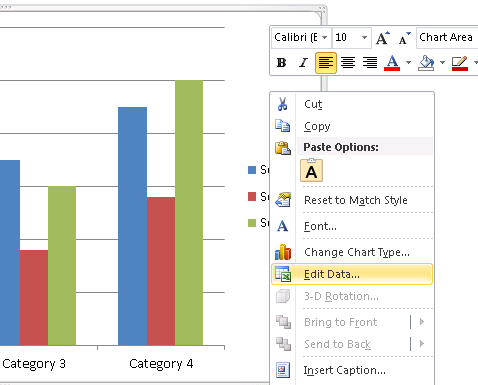 Open Microsoft Word, add any type of chart and click Edit Data. This will open an Excel chart with a predefined table. Here you can add Excel repeater command, which will fill and resize the table. You can use any JungleDocs supported command in this embedded Excel file. For more information on how to configure Excel templates, please read Configuring Excel templates. Here, Customers is a list where contacts are grouped by companies, and ByCompany is the list view name. Note: this table has a header row. So you should enter the command =Repeater(GetView("Tasks"; "MyChartData")) to A2 cell (not in A1). Save your changes and JungleDocs will fill this chart data according to your configuration.